Yes, even yellowjackets can be beneficial insects. They feed on aphids, caterpillars, flies and even grasshoppers. They also help with your clean-up chores by eating rotting fruit, decaying animals, feces and other stuff you'd probably rather not deal with. However, where they decide to nest can quickly turn them from friend to foe! I was recently weeding a planting bed near our barbecue when I was stung in the abdomen and chest by a couple of aggressive little wasps. Our outdoor fire pit and dining area are in the same general area and we, and our dog, hang out there all the time. The wasps were flying around a stacked-rock retaining wall, so I sprayed some hornet and wasp spray into the crevices and figured I had solved the problem. But a week later when I saw several wasps flying around the same area, I was surprised to see them emerging from the ground behind the wall. I decided I needed some help with the situation and immediately called Deb Conwayn with GirlzWurk in Saratoga. Deb is a beekeeper, does bee removal and relocation, and sells amazing honey. I was lucky to reach her right away and she came to our house the same day. When we removed a large section of the stacked wall and dug a few feet into the soil, we found a huge, eight-layer yellowjacket nest. Deb guessed that there were at least 5,000 live yellowjackets in there! She smoked and removed the hive and vacuumed up the wasps. Apparently, they had created their nest in an abandoned gopher hole. These yellowjackets were smaller and darker than most that I had seen so I sent the photos off to UC Davis for identification. Per Lynn Kimsey, director of the Bohart Museum of Entomology and professor of entomology at Davis, mine was a Vespula vulgaris, or common wasp. “It's the second most abundant yellowjacket in California after Pensylvanica, the so-called western yellowjacket.” said Kimsey. Vesplua is a small genus of social wasps. They, along with their sister genus, Dolichovespula, are known as yellowjackets or yellow jackets. Vespula vulgaris have a stronger tendency to nest in the ground than other species. Their normal habitat is dry grasslands and woodlands, however, they have certainly adapted to our urban areas. Only the queens survive the winter. They emerge in the spring to build their paper-like nests (made from chewed wood pulp) in hidden cavities like animal burrows, tree stumps, or in crevices like rock walls. 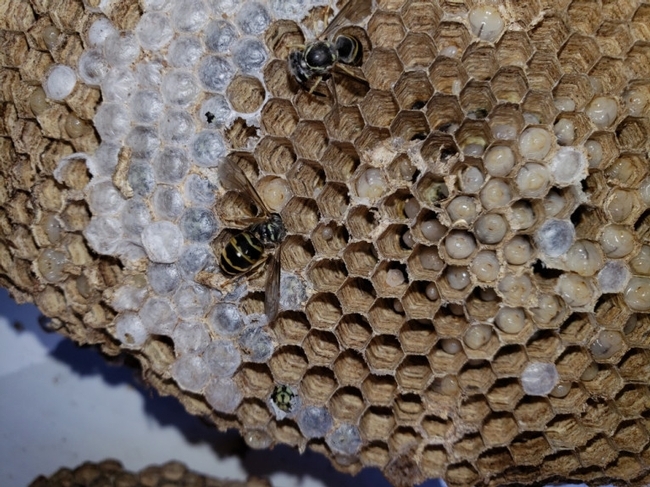 The initial brood of larva, which is cared for by the queen, hatch into workers who continue to build and protect the nest. They also care for the subsequent broods. Workers only live about two to four weeks and are replaced throughout the summer. Again, all wasps can be beneficial and definitely serve a purpose. But, if you or a family member are allergic to their venom or they have taken up residence in a place that is intolerable, you may want to take action to relocate or eradicate them. Deb Conway services most of the South Bay and can be reached at 408-373-0454. Find other good bee removal services at BeeRemovalSource. This article first appeared in the October 28, 2018 print issue of the San Jose Mercury News.